Honesty- How it Benefits You and Others, by Christopher D. Connors. Honesty is going to take you places in life that you never could have dreamed and it’s the easiest thing you can practice in order to be happy, successful and fulfilled. Honesty is part of the foundation of my core values and principles. Honesty cuts through deception and knifes its way through deceit and lies. Honesty leads to a fulfilling, free life. Honesty is not just about telling the truth. It’s about being real with yourself and others about who you are, what you want and what you need to live your most authentic life. Honesty promotes openness, empowers us and enables us to develop consistency in how we present the facts. Honesty sharpens our perception and allows us to observe everything around us with clarity. The opposite of honesty is deception — or lying. Lying is equally bad whether you are deceiving others or yourself. When you lie, you delude yourself into believing what you’re saying. You start digging a hypothetical ditch, even if with an infant-sized spoon, that will keep getting bigger over time. You confuse yourself, confuse others, lose credibility and put yourself in harm. The worst type of lying we practice, in order to deceive, is when we lie to ourselves. We start messing around with our concept of morality, right and wrong, as well as our dreams and desires. Times that I lied in order to do something that I knew was wrong, I could feel it. My inner core warred and rebelled against what I was mentally committing to doing because it was in contrast to who I really am. When I look back on it, every time I lied (that I can recall) I was trying to excuse or misrepresent my own shortcomings or to compensate for something. I was trying to pursue a sinful desire that would only, at best, produce temporary pleasure. Lies I told were often due to a lack of effort, positive morals or thoughts. Other times, I was convincing myself I wasn’t good enough or able to do something my heart was really set on. Lying or presuming I knew something I didn’t really know was the easy path. This discouraging thought manifested itself in ways that I couldn’t possibly perceive at the time. It set me back by delaying the pursuit of my dreams. It took away my ability to take chances that my heart was willing to take but my mind was blocking me from taking. Despite its temptation, ease of use and false promises, lying gets us nowhere in the end. We stay right in our own tracks or much worse, go backwards. Telling the truth when tempted to lie can significantly improve a person’s mental and physical health, according to a “Science of Honesty” study. The above results were presented at the American Psychological Association’s Annual Convention four years ago. Respectable, admired behavior is always carried out with honesty. Telling the truth and backing it up with actions show respect for what’s right and an esteem for ethical and moral integrity. 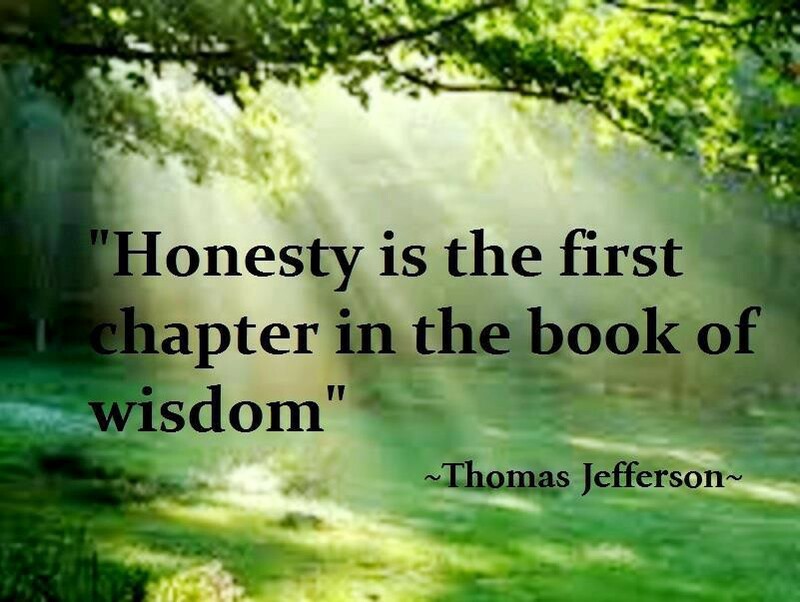 Honesty is one of the key components to character and one of the most admired traits of any successful, responsible person. Success, for me, is not quantified in terms of dollars, sales or number of Facebook followers. Particularly not the latter! I value success in terms of character, self-awareness, honesty, emotional intelligence and hard work. How we treat ourselves, others and how we use our talents to improve the lives of others. An emotionally intelligent person is a person of impeccable integrity and honesty; someone who can perceive and recognize the quality of honesty in another. Business transactions and the everyday transactions of human relations must be carried out with a code of trust and honesty or else everything will break down. I’ve always carried myself with a candidness (and I’d like to believe genuineness) which demonstrates a reflection of my thoughts. At times, I’ve been candid to a fault. But overall, I live with zero regrets. I believe candidness, openness and honesty has benefited me more than any other qualities in how I comport myself. Honesty has endeared me to many people of influence and, simply to my friends and loved ones. Honesty is never contrived or inauthentic — it’s always the genuine article. I’d much rather lay all my cards on the table and be forthcoming and transparent about my aspirations and intents. As I matured during my 20s, I learned to leave deception and lies to the CIA agents in the movies — in the land of fiction, where they belong. Honesty is the best use of everyone’s time. It’s led me to form a network of family, friends and business partners who I trust and respect, as we can all mutually benefit from this truth. There’s no coincidence that perhaps the most respected American in history, President Abraham Lincoln, is often referred to by the moniker, Honest Abe. Lincoln was shrewd, direct and honest in all of his human relations transactions and dealings. He was fair and just, a lesson he learned as a store clerk in dealing with customers at an early age. Do you want to be one of the most respected, highly thought of people among your social sphere and even your geography? Follow the example of the man thought of by many as the greatest American who ever lived. Honesty should be the bedrock of your foundation, as it will define who you are before you even allow others to know more about you. Honesty cuts through red tape, distraction, frustration and indecision. Honesty gets you where you want to go faster because you live how you really feel. You may not always know what you want in your future — whether that’s one month, six months or two years from now — but your intuition will give you a feel for what is in harmony with your heart. Honest intentions in speech and action gain the attention and respect of others. These people become the ones that you not only want to influence but be influenced by. The company we keep and surround ourselves with help to define our outlook on life, as well as lift us to places we couldn’t have arrived at entirely by our own efforts. Start today, first, by being as honest as you can with yourself. Be honest about your thoughts, words, actions and wants. Then think about your interaction with society and your personal relationships. Are you letting people know your true self? If not, what are you afraid of? How Were Birthstones Chosen for Each Month?